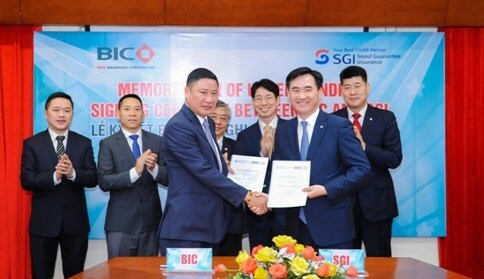 Hanoi (VNA) – BIDV Insurance Corporation (BIC) will cooperate with Seoul Guarantee Insurance (SGI) of the Republic of Korea (RoK) in developing guarantee insurance products in Vietnam under a memorandum of understanding recently signed by the two sides in Hanoi. They will also work together to propose state management agencies amend and supplement legal regulations to facilitate the development of guarantee insurance. BIC General Director Tran Hoai An said guarantee insurance is a new sector in Vietnam, with few insurance firms offering these services, and legal regulations have yet to be completed. However, he said, Vietnam has great potential for guarantee insurance development as the macro economy is forecast to grow stably, leading to an increase in demand for guarantee insurance. Guarantee insurance will offer another channel ensuring financial safety for customers, and contribute to the growth of the insurance sector and the national economy, he said. Guarantee insurance is commonly used in the construction industry as security for a project or piece of work agreed upon in a contract.